Welcome back to Thoroughly Thursday, the Caterwauling edition. The definition of “caterwaul” is “(of a cat) to make a shrill howling or wailing noise”. Cats do this for a variety of reasons: sadness, injury, the desire to breed, or in the case of our cat Bella, to tell the neighborhood felines to GET THE HELL AWAY from our backyard. It’s hard to describe the sound, though the words “torturous” and “ghastly” have a tendency to pop up a lot. Unfortunately, as Bella often caterwauls at 3am, it literally becomes the stuff of nightmares. The other night, I ran outside in the early-early-early morning in my pjs brandishing a dust mop to find she had gotten out (don’t judge) and was having a high-wire stand-off on the top of our neighbor’s garage with another cat, ala the final scene from Beauty and the Beast or the Crow. Moments later, the other cat ran off. Bella looked down at me from her perch, “Sup? You up too?” and then sauntered off, apparently to wake up more of our neighbors. I stood there a moment before I and my dust mop went back to bed. I’m reading a book recently gifted to my daughter called the The Trouble With Women. 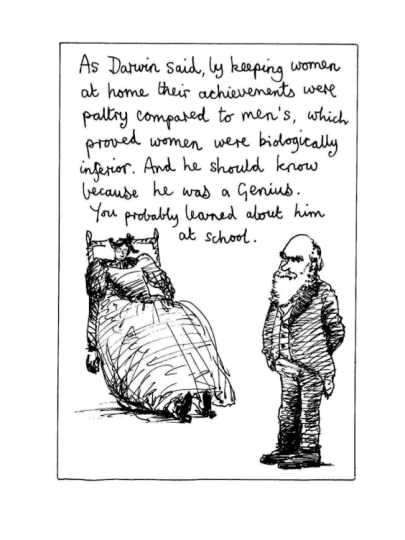 Written by illustrator and writer Jacky Fleming, the book attempts to explain why we know of so few women in history and the arts through history. She explains in both images and minimal text that it was, of course, that until 100 years ago, most women couldn’t study deep subjects due to their tiny heads and ultra-small brains. Why so few female painters? Weak hands. So few female athletes? 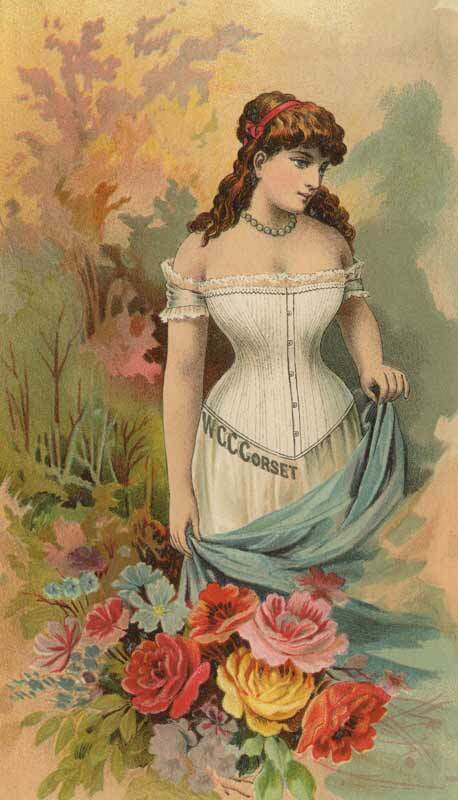 Because without corsets, women would fall over. Fortunately, they had men, which most often were geniuses, to take care of the hard tasks of making decisions for them. 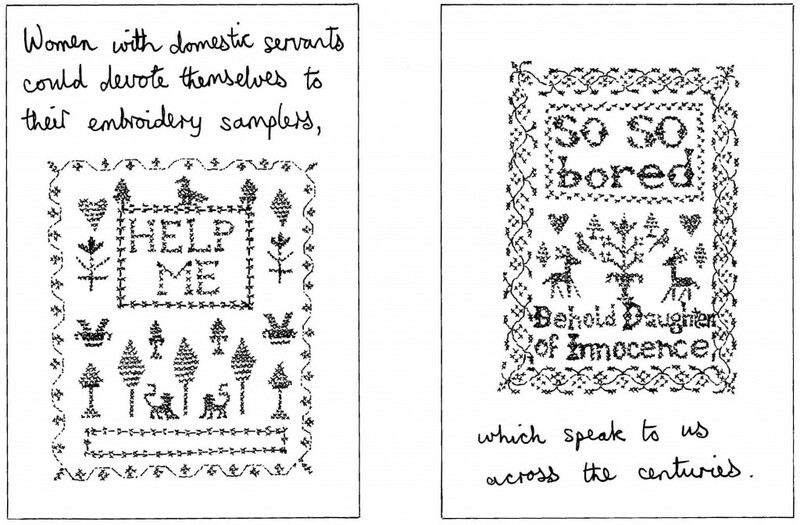 But, luckily they had needlepoint. The book is deeply satirical, funny, and sadly, still very relevant. This last week, I started watching Maniac, the new series on Netflix. What happens when the outcast son of a prominent family (who happens to suffer from schizophrenia) tries to befriend a drug addict during a pharmaceutical trial? Lots of mind-bendy explorations into consciousness, relationships and and alternate realities. I’m only a few episodes in, but series stars Emma Stone and (a really slimmed down) Jonah Hill have already pulled me in. I am a proud dance dad, and I like to think that I’ve developed a bit of a critical eye for ballet. In reality, I have no idea, but I have noticed that I’m far more impressed than I used to be when I see professionals at work. This week, I got to see STARDUST: a Tribute to David Bowie by Complexions Contemporary Ballet. Multiple pieces were set to the Thin White Duke’s various hits and performed by dozens of multi-ethnic dancers in a variety of ballet styles. It always amazing to see contemporary culture that inspires reinterpretation in other artistic genres. I highly recommend seeing them if you have the opportunity. P.P.S. Okay, it is amazing, but free solo climbing just gives me the willies.